I know there’s a majorly successful career dressing blog for female lawyers and MBAs that does suit deals on Wednesdays, but I’m a legal staffer, and most of the time, my budget wouldn’t even cover one piece of the beautiful suits featured. This blog is for legal professionals who have to bring their lunch to work and don’t have J.D. behind their names, so part of my goal is to prove that you can look polished and professional – for less. 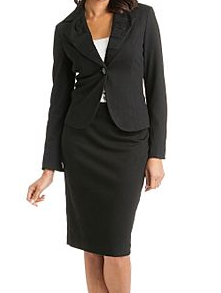 So I’m loving this Sharagano Black 1-Button Skirt Suit from SmartBargains.com, for its slim tailoring, minimalist big button approach, and pleated collar, available in sizes 6 – 18. It’s perfect for an interview, court, and a legal staffer’s checkbook. You had me at the collar. Check out the beautiful purple lining, too.